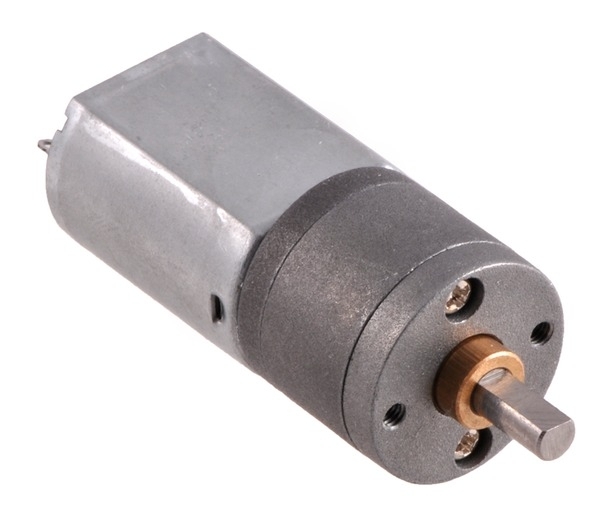 The 20D mm line of brushed DC gearmotors are available in three different gear ratios, all of which have the same dimensions except for the length of the gearbox. The gearmotor face plate has two mounting holes threaded for M2.5 screws, and you can use our custom-designed 20D mm metal gearmotor bracket (shown in the left picture below) to mount the gearmotor to your project via these mounting holes and the screws that come with the bracket. 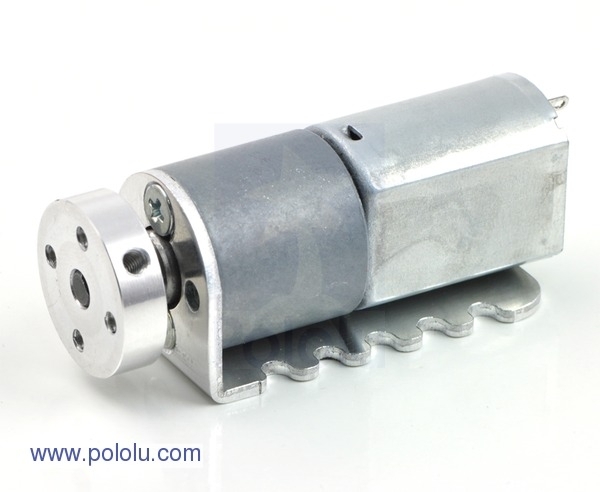 Pololu 20D mm metal gearmotor. 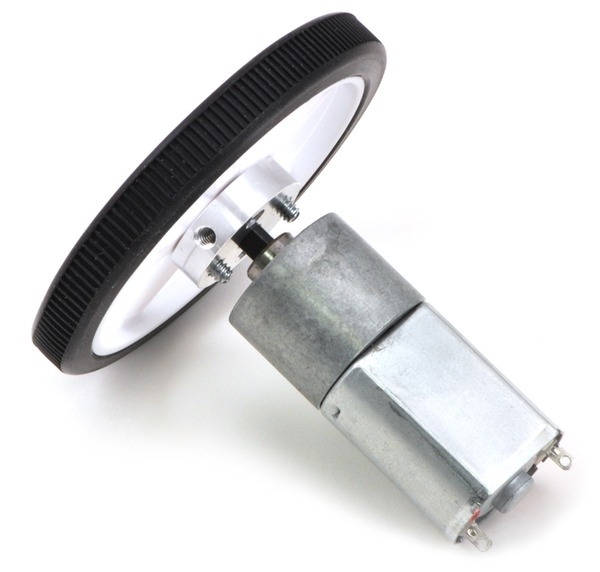 This gearmotor has an output shaft with a diameter of 4 m; the Pololu universal aluminum mounting hub for 4mm shafts can be used to mount our larger Pololu wheels (60mm-, 70mm-, 80mm-, and 90mm-diameter) or custom wheels and mechanisms to the gearmotor’s output shaft (see the right picture above). 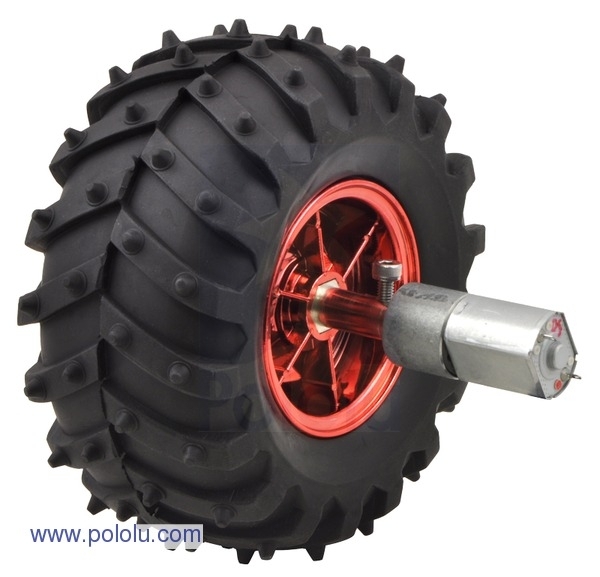 The gearbox’s output shaft also works directly with the 120mm-diameter Wild Thumper wheels, as shown below. The picture below shows the dimensions (in mm) of the 20D mm line of gearmotors. The value of L depends on the gear ratio of the gearbox: 29:1 is 15.7 mm, 73:1 is 17.2 mm, and 154:1 is 18.6 mm. 20D mm metal gearmotor dimensions (units in mm, L=18.5mm). Note: The older, discontinued 25:1 and 67:1 versions of this gearmotor now had a different mounting hole spacing and work with a slightly different bracket. This bracket is not compatible with the 29:1, 73:1, and 154:1 20D mm gearmotors we currently offer.